Except for City of San Diego holidays, the Pacific Beach/Taylor Branch Library is open to the public during the hours indicated below. Please visit the main website of the San Diego Public Library by (==> Clicking Here <==) for a schedule of operating hours for all branches. Books may be returned to the Library anytime, day or night, any day of the week including holidays, by depositing them in one of the two outside book drops: one book drop is located near the entrance to the Thomas Avenue parking lot, and the other book drop is located to the left of the Reed Avenue entrance to the Library. Items returned in the book drop when the library is closed are credited to the previous business day (i.e., if a book is returned in the book drop after the library has closed on Tuesday night, when the staff checks it in on Wednesday morning they will set the computer's date back so that it will credit as having been returned on Tuesday). 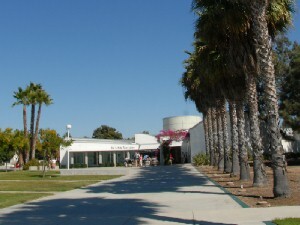 The Pacific Beach/Taylor Branch Library is located one block south of Grand Avenue in Pacific Beach. The library and surrounding park occupies the city block limited by Cass Street to the west, Dawes Street to the east, Thomas Avenue to the north, and Reed Avenue to the south. Patrons are advised to take Grand Avenue to Cass Street, turn (south) onto Cass Street, then turn left (east) onto Thomas Avenue to reach the Library and parking. (==> Click Here <==) for a printable, large area, location map and driving directions. Parking is available in lots on both the north side and south side of the library. Additional parking is available on the streets surrounding the library. Patrons are cautioned not to park along red-curbed areas; the police will issue tickets. The map below shows the locations of both on-site parking areas. The parking areas are shown in green. The library is shown in blue. (==> Click Here <==) for a printable version of the parking map.